Were you affected by an outbreak illness on a package holiday in Tunisia? YourHolidayClaims have already helped UK holidaymakers receive hundreds of thousands pounds in compensation after outbreaks of illness in Tunisia. 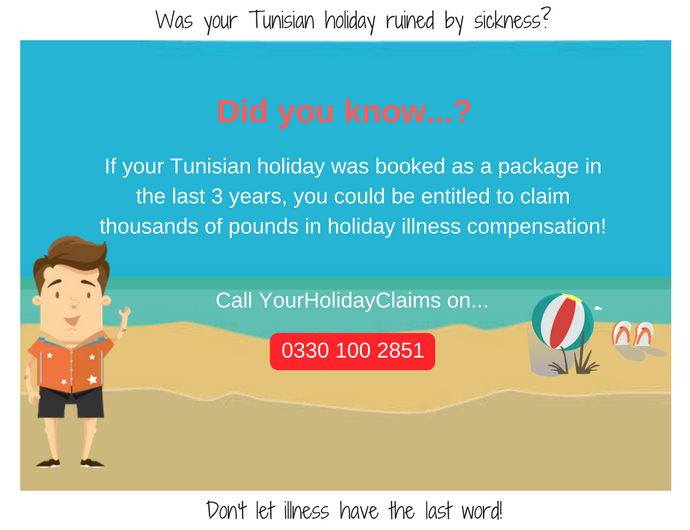 Here at YourHolidayClaims we have market leading team of holiday claims experts with a long-standing reputation for helping holidaymakers affected by sickness in Tunisia receive the compensation they deserve. If you have fallen ill on a package holiday in Tunisia in the last 3 years, you may be entitled to receive thousands of pounds in compensation. When you contact the experienced holiday illness solicitors at YourHolidayClaims, you can quickly discover whether you could be entitled to bring a claim for compensation. Could you be legally entitled to holiday illness compensation? Under the Package Travel Regulations 1992, your tour operator is liable for any failings in food or hygiene standards at your package holiday hotel. This means that if you have suffered an illness caused by poor hygiene standards in an all-inclusive Tunisian hotel, you may be entitled to make a claim directly against your tour operator. Here at YourHolidayClaims, our specialist solicitors have over 50 years combined experience helping people whose holidays were ruined by illness in Tunisia receive the maximum compensation for their claim from their tour operator on a no win no fee basis. You can find more information on how much compensation your claim could be worth here. The specialist solicitors at YourHolidayClaims have recently helped a family of 5 receive £19,500 in compensation after their entire party suffered salmonella at the Caribbean World Hammamet Beach Hotel in Tunisia. Brenda Farthing and her family were affected by symptoms of sickness, diarrhoea and crippling stomach cramps. The illness continued to affect the family on their return from Tunisia with one family member even left with post infective irritable bowel syndrome. After contacting the specialist Tunisia holiday illness solicitors at YourHolidayClaims, the Farthing family were able to bring a successful no win no fee claim against their tour operator, Just Sunshine. Don’t accept illness as part of the package in Tunisia! To find out if you could be entitled to receive compensation, call our holiday illness experts today on 0330 100 2851.